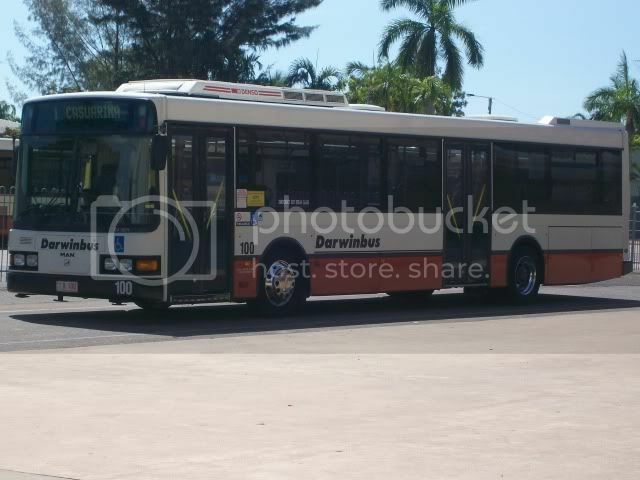 ATDB • View topic - My week in the Territory Part 5 -DBS Buses. 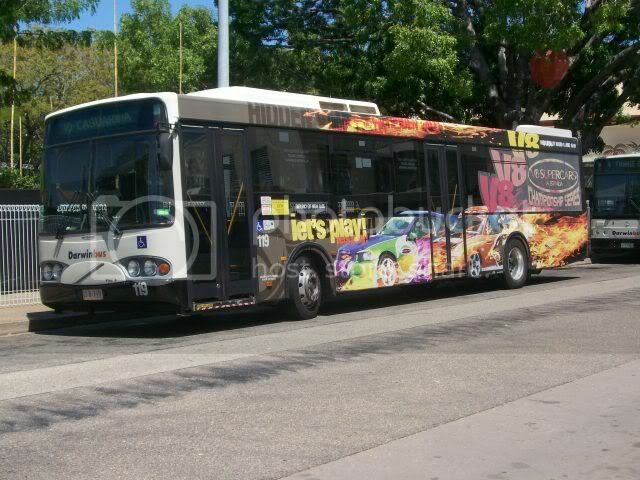 My week in the Territory Part 5 -DBS Buses. 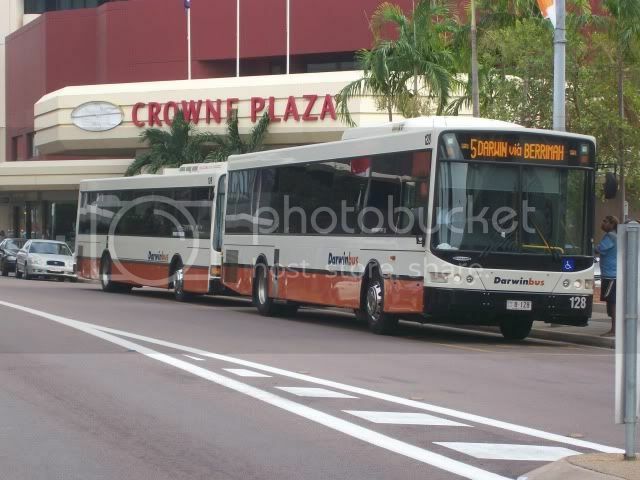 DBS, or Darwin Bus Service, is the government operator, along with Buslink who operate all Urban route services in Darwin. 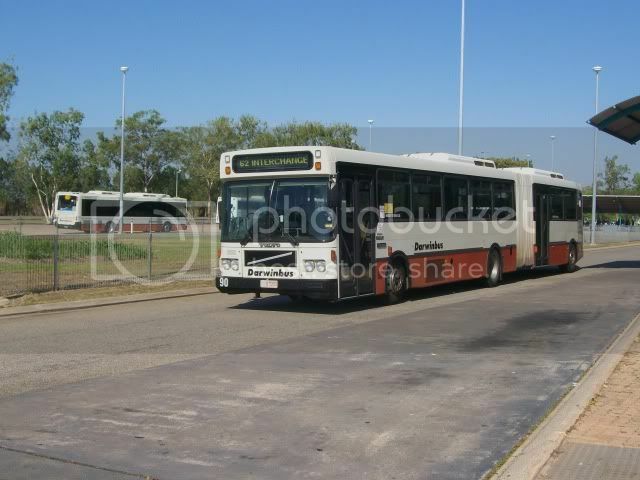 Darwin Bus Service 100- m/o 8.100, a 1995 MAN NL202/Volgren CR221L at Casuarina. 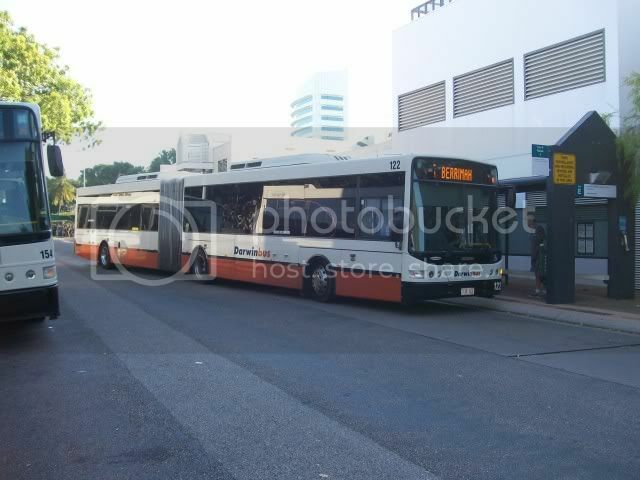 Darwin Bus Service 128- m/o 8.128, a 2008 Mercedes 0500LE/Volgren CR228L, in Mitchell Street. Darwin Bus Service 119, m/o 8.119, a 2002 Volvo B10BLE/Volgren CR222L advertsing V8 Supercars, at Darwin Interchange. Darwin Bus Service 121, m/o 8.121, a 2004 Scania L94ua/ Volgren CR224L Articulated. 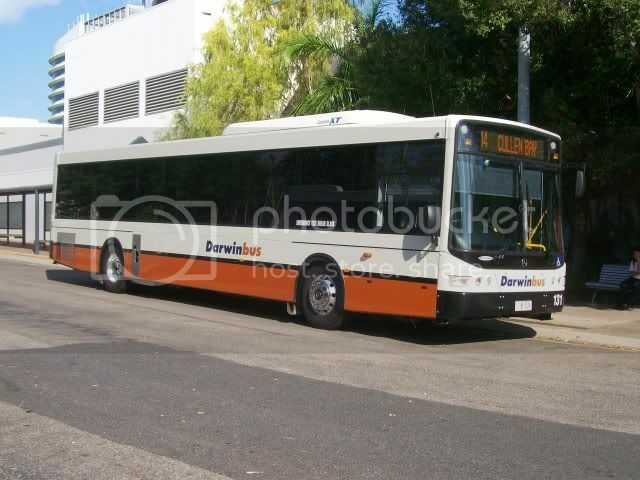 Darwin Bus Service 122, m/o 8.122, a 2006 Scania L94ua/ Volgren CR228L Articulated. 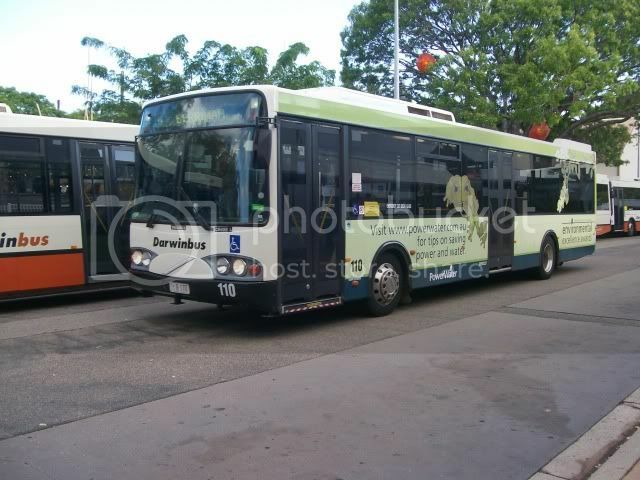 Darwin Bus Service 90, m/o 8.090, a 1994 Volvo B10M/Volgren Articulated. 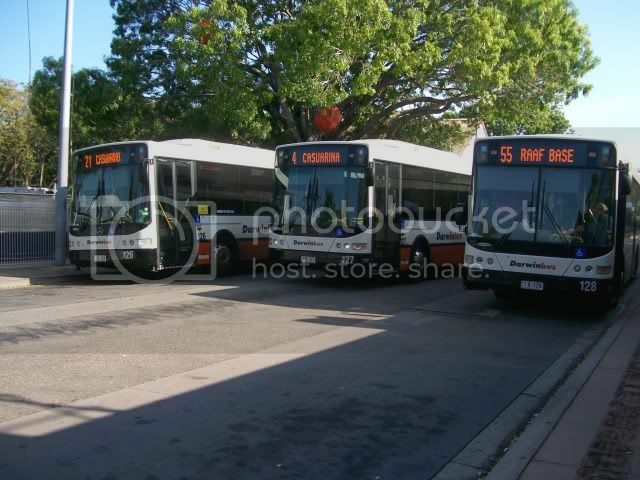 Darwin Bus Service 126, 127 and 128 all meet up at the Darwin Bus Interchange. 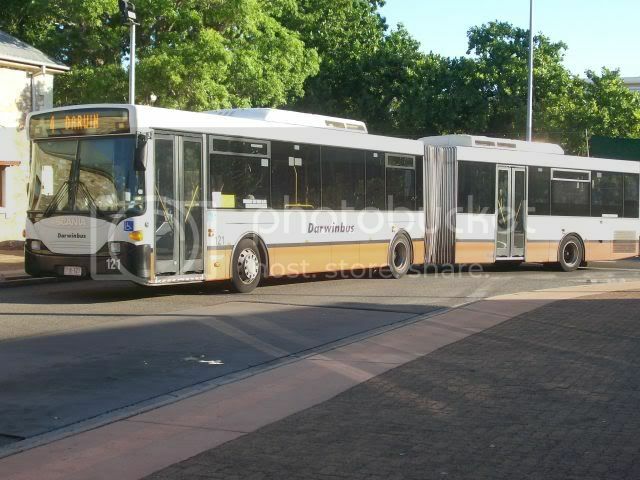 The newest Low Floor in Darwin is DBS 131, a 2010 Mercedes 0500LE/ Volgren, seen at Darwin Bus Interchange. 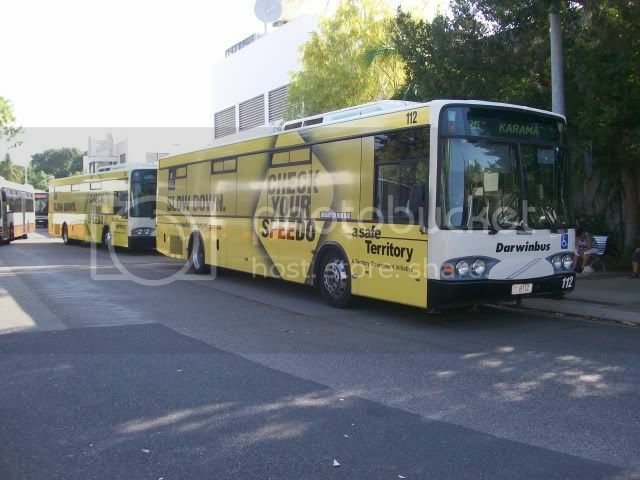 Re: My week in the Territory Part 5 -DBS Buses. Love those Darwinbus artics #90 Volvo B10M/Volgren, #121 Scania L94UA/Volgren CR224L & #122 Scania L94UA/Volgren CR228L as well as others Darwinbus AOA Buses. I hope you had a great time in Darwin. Last edited by Bradley on Wed Aug 25, 2010 9:47 am, edited 1 time in total. Favourite Vehicle: Volvo B10M Mk4, Volgren Artic. Coach_Captain they are AWESOME pics of the Top End. Very nice work. I got the classy swag,Now that's why I get flagged. That V8 Supercar AOA is VERY nice! Great pics! And as rumour has it, DBS 90 is now in Melbourne. Kitare wrote: And as rumour has it, DBS 90 is now in Melbourne. MetroTasCatcher wrote: That V8 Supercar AOA is VERY nice! Great pics! Love the variety of Volgrens (made even better with all the flat window lines)! I'd definitely like to visit Darwin someday. shovelyjoe wrote: Love the variety of Volgrens (made even better with all the flat window lines)! I'd definitely like to visit Darwin someday. Was only going to stay Sunday-Wednesday, but could only get on the Ghan on the Saturday, so a week in Darwin was really something. Great to see how things are done way up north, maybe the rest of Australia could learn a lesson or two. The Darwin buses are always so immaculate. The views expressed by me are mine and mine only. They do not neccesarily fall in line with the views of my friends, family, collegues or my employer. Those were awesome buses. I really wonder that still public transport rocks. You might happy to know that Luxury bus-maker Volvo unveiled a range of four multi – axle buses.